Whether I get to visit this fabulous cosmopolitan city of Milan, Italy this year or in years to come, just being introduced to it because of my husband's travels it has made my personal bucket list of places that I wish to someday experience. Milan has existed as a population center for centuries before the birth of Christ under the ruling dominion of different tribes of people and has survived everything from wars to epidemics. Over the centuries it has morphed into a commercially prosperous city filled with historical churches and houses the third largest cathedral in the entire world. 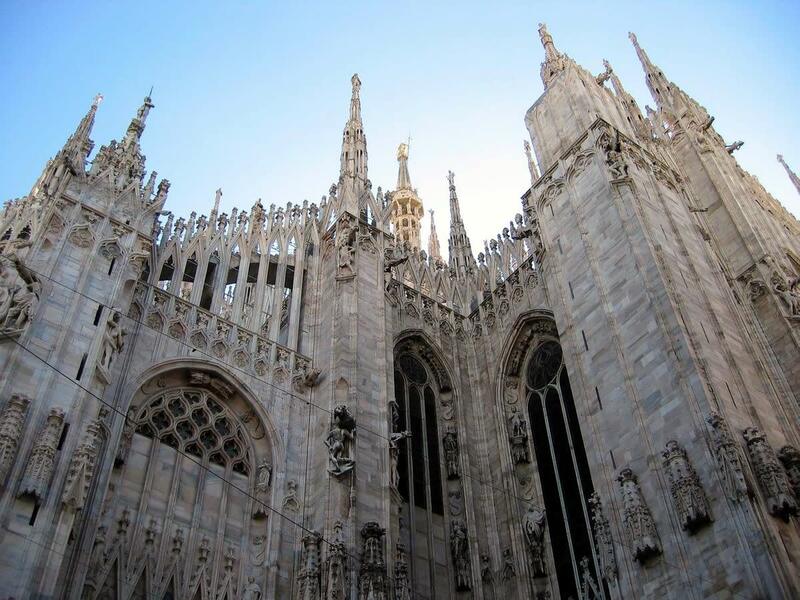 Milan also contains art galleries, gardens, the famous La Scala Opera House, a castle, the original Galleria and is a noted high fashion center among other things. It will be there when I make plans to follow in my husband's footsteps to Italy someday. One day he ventured out on a sightseeing self guided walking tour of Milan back in 2006. He was taking a break from the wine business that took him to that metropolis. Some people come to Milan to check out some of the high designer clothing. Others just wish to sate one's appetite at a cafe or restaurant in what has become a favorite haunt of those who live in Milan. 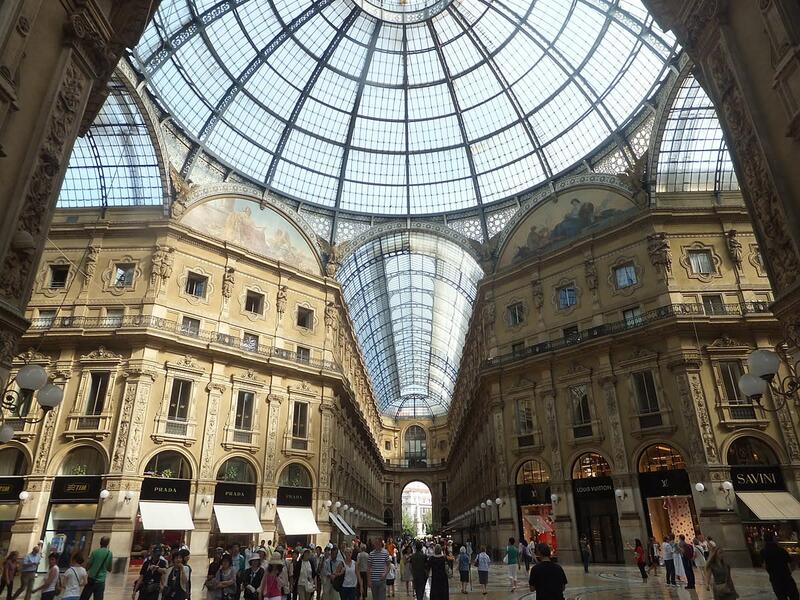 Be sure to visit this architectural gem of a building the Galleria Vittorio Emanuele II which connects two important plazas. It is sure to impress one upon seeing it for the first time as it did my husband. The architect of this magnificent iron and glass domed structure, Giuseppe Mengoni, sadly fell to his death off of some scaffolding prior to its completion. 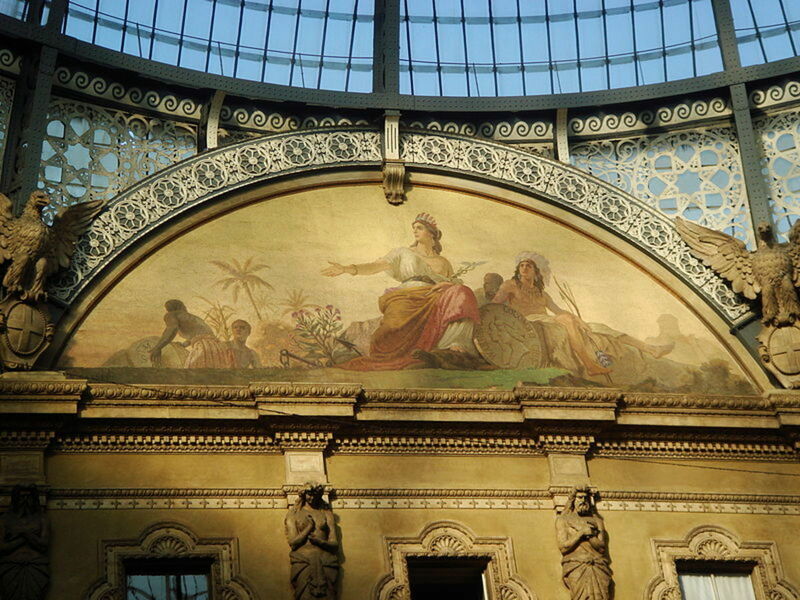 There are frescoes and mosaics embellishing this stunning architectural beauty of a building. It was opened two years after construction started in 1865 and took on the name of the king Vittorio Emanuelle II. The eye catching and unique design of the Galleria Vittorio Emanuelle II has inspired similar buildings around the world including a Galleria shopping center in Houston as well as one in Dallas, Texas. Having been in both of these Texas Galleria's, I had no idea that the original prototype design came from Italy. The glass domed ceiling in Houston's Galleria looms above three stories with an ice skating rink at the lowest level. Balconies with railings allow shoppers and visitors to look down upon the ice skaters while also being able to enter all of the retail shops and restaurants which surround that portion of the Galleria. 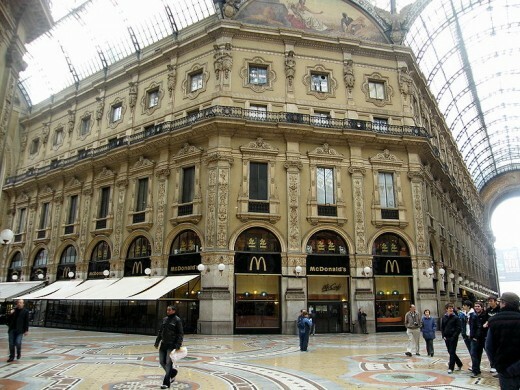 In Milan, the Galleria Vittorio Emanuele II connects two important plazas, the Plaza del Duomo and the Plaza del Scala. Thus it becomes not only an attraction when wondering what to see in Milan but also a gorgeous conduit between two of the other sites one should also visit while in that city. 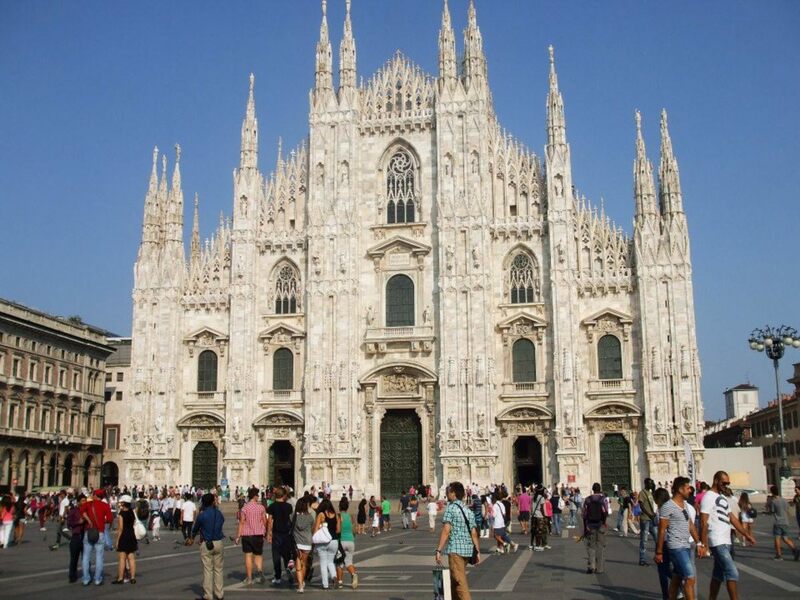 Located in the historic city center of Milan, the Duomo is a gigantic cathedral of epic proportions. Only St. Peters in Rome and a cathedral in Seville and another one located on the Ivory Coast is larger. Taking over five centuries to build and completed in 1813 upon the orders of Napoleon Bonaparte, the base of the cathedral is Baroque in style but was completed as Gothic. 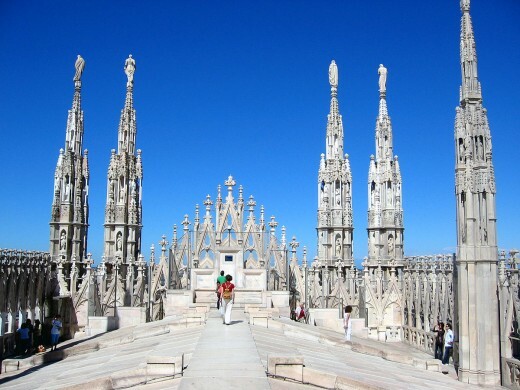 Numerous spires lift towards the heavens in typical Gothic style and there are about 3,500 statues which range from saints to animals and even monsters. 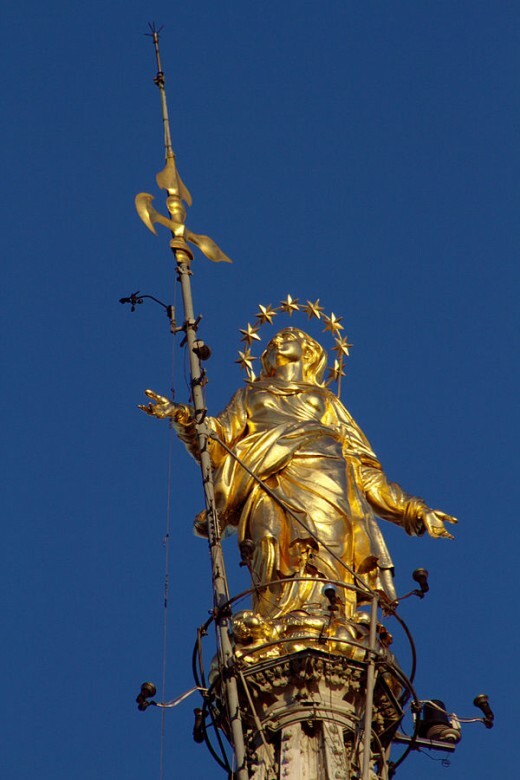 A gilded 14 foot (4.16m) golden statue of the Madonna tops the tallest spire and it was sculpted by Giuseppe Bini in 1774. It weighs 3 tons and is called La Madonnina. It can be viewed better from the roof terraces where visitors can not only see it, but also the many other spires and buttresses of the cathedral...and even views of the Swiss Alps on a clear day. Needless-to-say views of Milan from this perspective are also impressive. Interior views of the Duomo are equally impressive. With five different aisles, 52 columns (piers) each decorated with a statue of a saint, elaborate and colorful stained glass windows depicting scenes from the Bible and marble floors there is much to catch the attention of a visitor or someone attending mass in that environs. The cathedral can seat 40,000 people! That is like seating an entire medium to small town's population in one building! The Duomo is filled with resplendent types of art and treasures such as can only be accumulated over many centuries and with dedicated effort. Obviously one could spend quite a bit of time exploring all of the nooks and crannies of this cathedral even including what lies below the main floor where one can see ruins dating back to the 4th century. This is definitely one of the sites to see as a visitor to Milan! Located in Milan's historic center is the world famous La Scala Opera House which has one of the largest stages in Italy measuring 13,000 square feet (1,200 square meters). 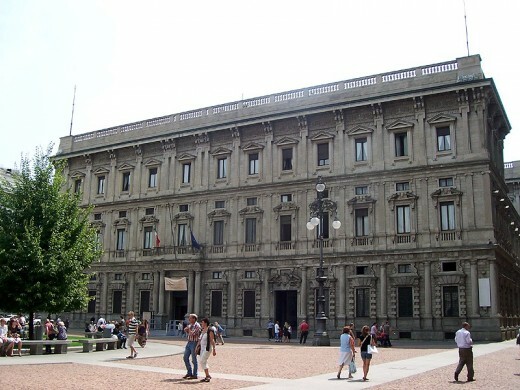 Located on the Plaza del Scala, the outside facade of this building is not all that impressive. However that changes dramatically when one enters the interior spaces. The auditorium can seat 2,015 people and the acoustics are reputed to be exceptional. Elaborately decorated with gilded stucco work, fine woods and warm colored red velvets, it along with the mirror-lined salon provides an elegant setting for watching operas and ballets. It stands on the site of a former church called Santa Maria della Scala and derives its name from that. La Scala was built by Giuseppe Piermarini from the years 1776 to 1778 but sustained much damage from the bombing in World War 2. It was rebuilt and Arturo Toscanini played a memorable concert on that newly rebuilt stage in 1946 and once again this prestigious theater was delighting audiences from not only Italy, but from around the world. I would love to be able to watch an opera or a ballet from one of the numerous boxes where one could look down upon the stage in style and comfort. Perhaps someday that wish will be fulfilled. This elaborately built and decorated palace for the Marino family dating back to its completion in 1563 is now the site of Milan's city hall since the year 1861. A statue of Leonardo da Vinci is situated in the Plaza del Scala. This historic structure was built in 1368 by Galeazzo II Visconti as a fortress but was eventually transformed into a palace. 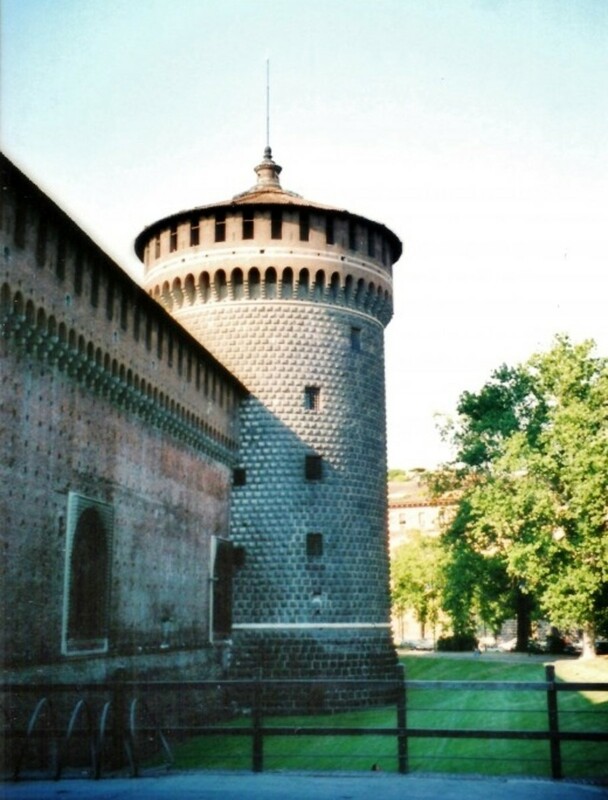 In intervening years it suffered damage from warring factions but upon Francesco Sforza becoming the lord of Milan in 1450 it was once again established as a magnificent palace. Notable artists like Leonardo da Vinci and Bramante painted frescoes that remain there today even though the buildings reverted in later years back to serving as a military post. Fortunately, when it was being considered for demolition, the architect Luca Beltrami came along and it was restored and by the year 1904 it has served Milan as a wonderful setting for a number of museums. Art lovers as well as those who appreciate history by looking at artifacts could undoubtedly spend the better part of a day there viewing everything that there is on display. These things and more could keep interested parties enthralled and happily engaged in learning about the past in this historic site. I know that I would certainly enjoy visiting there! Some of the sites mentioned in this post located in Milan, Italy. Obviously there is much more to enjoy if one plans a trip to Milan, Italy. The few things mentioned here just scratch the surface of what there is to do and see. Milan is currently the second largest city in Italy and the capitol of the region of Lombardy. It has much of historic interest dating back to even before the days when it became the capitol of the Roman Empire. From church history to military history, this city has gone though numerous changes through the ages. Interesting architecture as well as art abounds. My husband did not have time to see Leonardo da Vinci's famous Last Supper painting because of his business schedule but it will certainly be on my list of things to see. That as well as other historic buildings, churches, museums, gardens, art galleries and shopping should keep me busy for awhile. Being a furniture as well as high fashion center, I may have to settle on window shopping due to the high prices of couture fashion. But that can be fun as well! It is also nice to know that if I wish to see some of the lakes of northern Italy, there are many of these scenic beauties not far from Milan including Lake Maggiore, Lake Como and Lake Garda among others. We love watching Rick Steves on television. 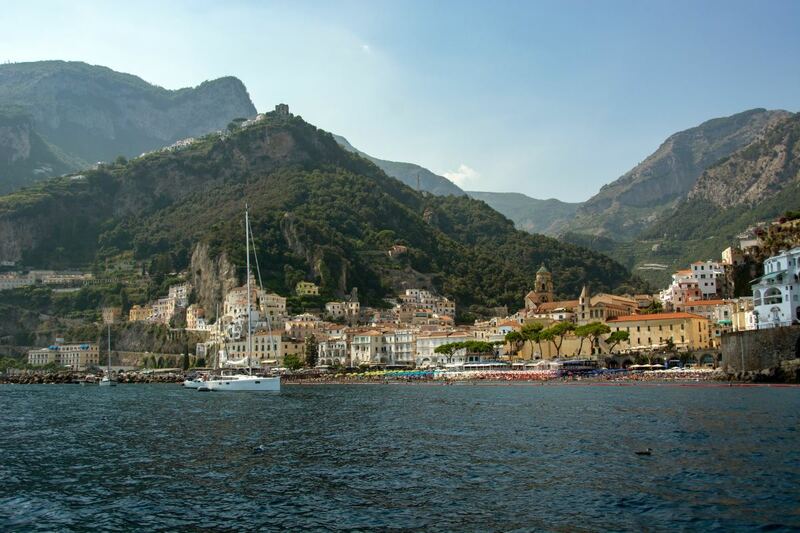 Anyone planning a trip to this region of Italy would be well served to check out his inside tips on what to do and where to stay. Does Milan look like a city in which you would enjoy a vacation? Don't have to visit Milan since I live there! Glad you enjoyed this post regarding the visiting of Milan. Our world is certainly filled with many attractions! Feels good to be here once more. A city with amazing architecture, buildings and a lot of history it would be a joy to visit. Thanks for this informative article and awesome photos. 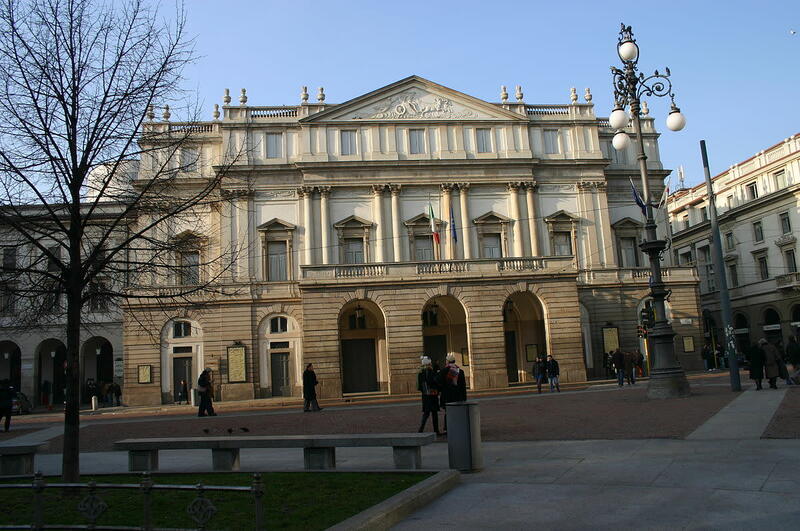 I would also enjoy seeing an opera at La Scala as well as doing many other things in Milan. Hope your dream comes true someday. It is wonderful that you have been able to travel to so many places around the world. Nice that you have gotten to see parts of Milan while on your way to Switzerland. Hi Peggy. This is a beautiful hub on MIlan. We used to get our car rental from here when we visited family in Switzerland and enjoyed this city. Though industrial, there are some pockets one can explore and enjoy. It must be fun living in Milan! I know what you mean about not rushing out and seeing local sites when you live in a place. We have recently been doing more sightseeing in our own city of Houston and it is fun and educational. Enjoy your time in Milan. 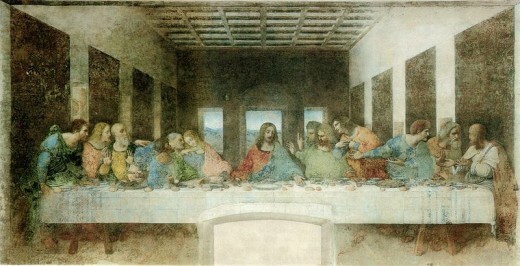 Nice that you have been to Milan and have gotten to see Leonardo's Last Supper in person. I don't think that my husband had a need to take the subway while there. Interesting that it is done in black. Wonder why? Thanks for your comment. 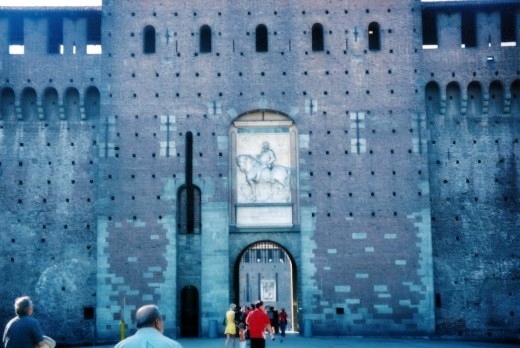 Hi Peggy, Thanks for your great photos of Milan which reminded me of my two visits there. I saw The Last Supper and it was an interesting experience. It is now in an air-controlled environment and they let in only small groups of people at a time through glass partition doors. The restoration work looks quite good. One thing I didn't like about Milan is that their subway system is entirely black colour! Thanks. 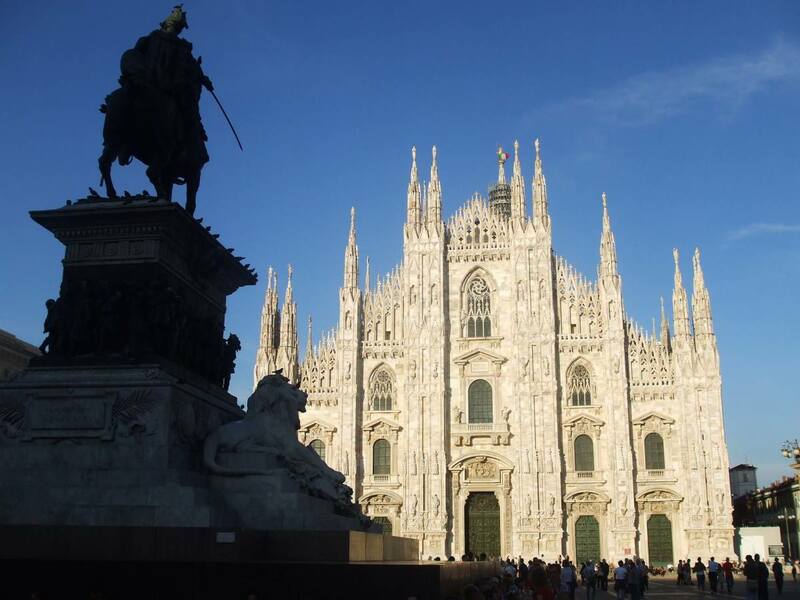 Thanks for taking your armchair tour of walking and seeing some historic sites in Milan, Italy. Appreciate your comment. Your travel hubs are amazing. I love the way you give personal touch to your descriptions. As an arm chair traveler, I enjoyed sightseeing in Milan. Thanks for visiting Milan via this hub and my husband's photos of what he got to see in one day while there. It does look like a fabulous city to visit. Appreciate your votes and the share. Peggy, the Milan tour is just awesome. Voted up and awesome and sharing. 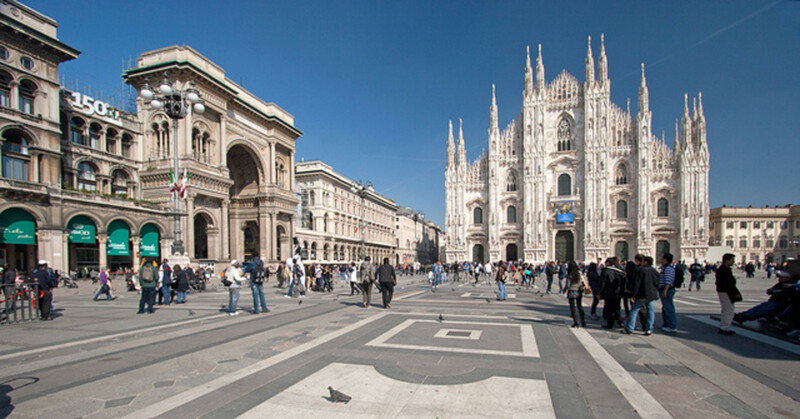 So glad that you enjoyed this virtual tour of Milan, Italy. My husband loved what he got to see and do while there. Thanks for your comment. Bruce is fortunate to have been able to spend a slight amount of time outside of his business to be able to see the sights in Milan that he did. Obviously a person with more time could enjoy that city for many days without running out of things to do and see. Thanks for your comment. Another beautiful city with great architecture. I would love to visit Milan. 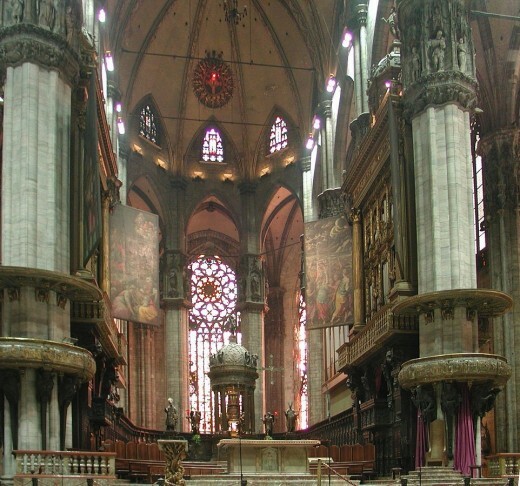 You have given great history, photos and videos of the beautiful cathedral Duomo. The architecture, art and history is absolutely one to treasure for a lifetime. Interesting and wonderful hub. Milan is that also...a fashion and financial center, but as you now know it has many sites of a historic and artistic nature. Thanks for your comments and votes. I didn't stop over in Milan on our last trip to Italy because I thought it was the capital of design and modernity, and didn't have much in the way of history and culture. Your hub disproves my assumption -- would love to have seen that Galeria. Voting this Up and Useful. Milan would be fun to see and be able to spend some time there. Maybe someday...! Thanks for your comment. Thanks for your comment and vote on this hub about Milan and what can be seen on a self-guided walking tour for people with not much time. It would be fun to see much more of this cosmopolitan city. Very interesting Peggy! Would love to go there myself! There is so much to see! Milan is a great place indeed. I haven't been there but this hub tells me so many interesting things about this a city where some tourism destinations ranging from sight seeing, artistic and historical buildings, precious paintings up to religious tourism are well preserved here. Thank you Peggy, tt's an awesome trip and deserves voting up. I've seen photos of that floor mosaic in Milan's Galleria. If it is the same one you are talking about, I think it is under that domed section. Maybe it serves the same purpose as the Trevi fountain in Rome? Added another photo showing more of the floor. 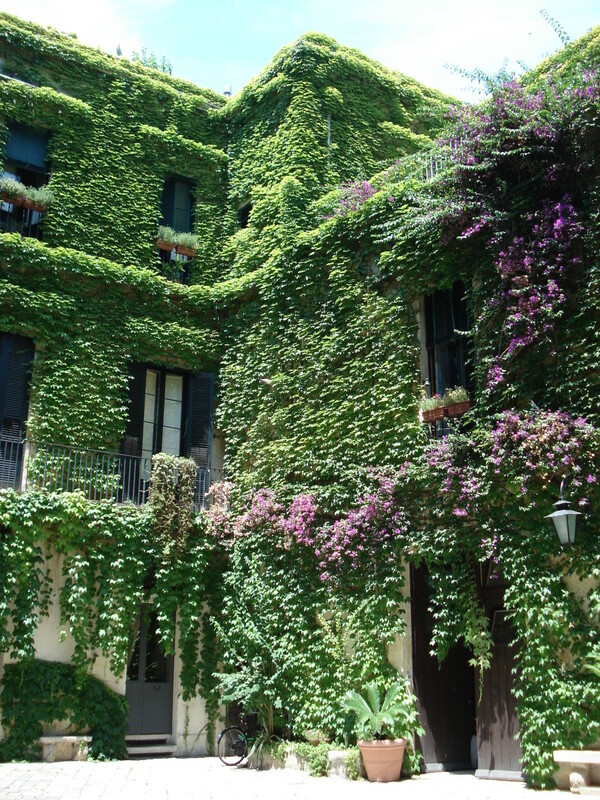 In any case, I would love seeing that and the art nouveau building and other places as well in Milan someday. Thanks for your comment. There are mosaics on the floor of the Galleria and it is customary to put your heel on one of the signs of the zodiac and spin around three times. I cannot recall which sign it is but I think it is meant to bring you good luck. Milan has an area where there is a wonderful Art Nouveau style building, which is worth seeing if you like the style. So happy to hear that you found this hub on Milan helpful. Hope that you get to visit there someday and see it for yourself. Thanks for your comment. Peggy, you still the best tour guide here in Hubpages. I always enjoy your travel hub, including this one. Every time I visit your hub, I always find the new one. This is one of the best work from you. I can't wait to visit Milan soon and I'll put Milan on my travel list. Great pictures and very well description. Good job and rated up! Hopefully I will get to see parts of Italy such as Milan and elsewhere in person someday. All of Italy has its own special kind of beauty from what I have read and seen. More hubs coming...all from my husband's travels to that scenic country, so stay tuned. Thanks for your comment. All I can say is "me too!" Would have loved to have been strolling around Milan, Italy and seeing the great sites there. Thanks for your comment. Peggy you have out done yourself! Italy is my favorite destination of all time and Milan and Rome are at the top of that list! Keep the great hubs coming! Great hub. Sure wish I could have been with Bruce on that trip.